Dread Hollow is a unique attraction that adds a new level of fear to the traditional haunted house. Hidden in plain sight in the valley of Chattanooga, TN, Dread Hollow appears to be like any other unassuming small town found in the shadows of highways and byways, but visitors are unaware of what truly lies within - until it is too late. Dread Hollow's cryptic reality and appalling past loom ominously inside 20,000 square feet of pure terror. Created by the masterminds of nationally-ranked Ruby Falls Haunted Cavern, Dread Hollow is an immersive horror experience with petrifying storylines, unnerving illusions, and gruesomely-interactive actors, making this haunt one of the most horrifyingly innovative in the nation. Make your way through the ominous town built on tainted soil to the Belle Royale Hotel as a paranormal investigative team unearths evidence of harrowing supernatural activity from a scorned bride and other tormented souls, eternally doomed. Stumble into the seemingly idyllic Harley Farm where darkness and evil extract a bloody price for Ezra Harley's desperate decision. Wander into the abandoned fairgrounds of the cursed Brine Bros. Circus to discover banished sideshow freaks beckoning visitors to forever join them in their Cirque de Fatale. There is nowhere to hide from the sinister darkness of 3 haunts combined into 1 terrifying nightmare. Every Thursday, Friday, Saturday and Sunday night in October. Plus Halloween night! Opens at 7 pm - closing times vary. 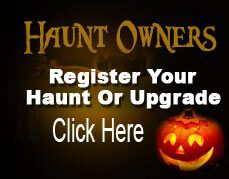 WARNING: Extreme Haunt Attraction! Not recommended for children under 12. However, younger children may come if parents choose to bring them. Carrying babies through is not allowed. There are no special prices for children and no refunds if anyone decides not to complete the attraction.